eG Innovations, a global Citrix technology partner, and DABCC joined hands to conduct an industry survey across 795 Citrix professionals worldwide. The survey was conducted between November 2017 and February 2018 across all verticals and industry segments covering organizations of all sizes (a few hundred users to 10,000 users and more). The goal of the survey was to understand the industry trends around the migration to the latest versions of Citrix’s product lines – XenApp and XenDesktop 7.x. The older version of XenApp, version 6.5 is nearing end of life (June 30, 2018). With this in mind, many organizations are migrating to the new version 7. This version represents a significant change in the way Citrix services are being delivered. The architecture has changed – several new application components have been introduced for scalability. The communication protocol has evolved to perform better in low bandwidth, loss-prone networks, and new features have been introduced to speed up logon times, enhance graphics delivery, and more. Cloud deployment is also an option. Citrix Cloud offers options for hosting the core servers in Microsoft Azure or on-premise, while the control plane of the infrastructure is maintained and operated by Citrix. While version 7.x offers several new capabilities, it is also disruptive in a few ways. Client applications must be hosted on the latest Microsoft Windows operating systems – this is a challenge for legacy applications. Furthermore, some features that were available in version 6.5 are no longer present in the latest version. As a result, this requires some reconfiguration to ensure that policies defined in the earlier version work effectively in the latest version. All of this means that the migration to the latest version is not a simple in-place upgrade any more. The survey results shed light on the plans, issues, and expectations that they are having when migrating to Citrix XenApp and XenDesktop 7.x. The analysis of the survey has been compiled into an industry insights report that reveals migration trends, factors driving the migration, adoption of Citrix Cloud, top concerns of Citrix professionals, and expectations for performance management. 2018 will be the year of Citrix migration. 70% of organizations will complete the migration to XenApp and XenDesktop 7 by the end of the year. The main driver behind the migration to 7.x is the fact that older versions are nearing EOL/EOM. LTSR and Windows 10 support in 7.x are other important factors. 78% rate the pre-migration and post-migration phases to be very challenging. A major performance challenge during the migration to 7.x is pinpointing how infrastructure issues are affecting Citrix performance. Organizations are using too many tools (up to 10 tools) for monitoring their Citrix infrastructures. 91% agreed that having a single-pane-of-glass monitoring solution would simplify troubleshooting. 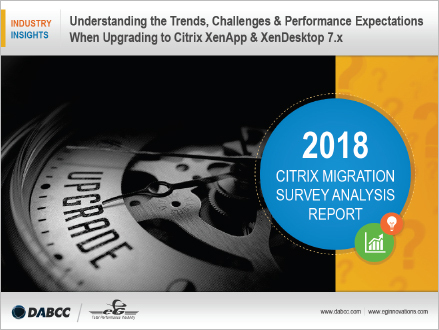 Download the full survey analysis report and learn from the experience and insights of other Citrix pros that are going through the migration to Citrix XenApp and XenDesktop 7.x. 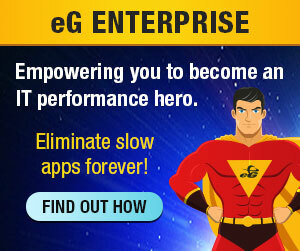 eG Innovations is the world’s leader in application and IT performance monitoring. Get your free trial of our Citrix monitoring system today!